The Administrative Office of the Courts just released the FISC annual report, the first full year report issued after USA Freedom Act. I’ll work on more analysis in a moment, but wanted to point to something that is fairly remarkable, if I’m reading the report correctly. Here’s the top line report for the year. Note, in particular, the 1881a line. The government submitted this number of certification(s) during calendar year 2016 but the Court did not take action on any such certification(s) within the calendar year. 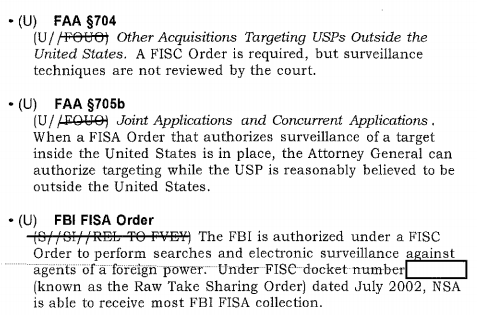 That, plus the “0”s in the table, seems to state clearly that the FISC did not approve last year’s Section 702 application. What that likely means, given the precedent set in 2011, is that the government submitted applications (usually they do this with a month of lead time), but the court would not approve the applications as submitted. In 2011, the government got a series of extensions, so 702 never lapsed. The prior approval before last year was November 6, 2015, so it would only have had to have been extended 2 months to get into this year. So that seems to suggest there was at least a three month (application time plus extension) delay in approving the certifications for this year. Note, too, that the report shows the only amicus appointed last year was Marc Zwillinger for a known PRTT application, so this hold up wasn’t even related to an amicus complaint. In any case, this may reflect significant issues with 702. Update: Here’s the 2011 702 opinion, which documents the last known time this happened (though there must have been a roughly month-long delay once since then). After submitting an application in April for May reauthorization, the government got two 60-day extensions, and one more month-long extensions, with final approval on October 3, 2011. It appears there was no big problem with getting the extensions (though at one point, Bates had a meeting with DOJ to tell them he was serious about the reapproval process), so presumably any extension in November would have been granted without much fuss. One other thing that is worth noting. On September 27, 2016, then Assistant Attorney General John Carlin announced he would be leaving in a month. Mary McCord (who announced her own departure today) took over on October 15. So the transition between the two of them would have happened in the weeks before the certificates would have normally been reauthorized. Whatever Carlin’s reasons for leaving (which has never been made public, as far as I know) the transition between the two of them may have exacerbated any delay. Among the many posts I’ve written about Executive Order 12333 — the order that authorizes all non-domestic spying — includes this post, where I noted that proposed changes to NSA’s phone dragnet won’t affect programs authorized by EO 12333. Obama was speaking only about NSA’s treatment of Section 215 metadata, not the data — which includes a great amount of US person data — collected under Executive Order 12333. Basically, the way NSA treats data collected under FISC-overseen programs (including both Section 215 and FISA Amendments Act) is to throw the data in with data collected under EO 12333, but add query screens tied to the more strict FISC-regulations governing production under it. That’s precisely the point made in an important op-ed by the State Department’s former Internet freedom chief, John Napier Tye, who had access to data from EO 12333 collection. Executive Order 12333 contains no such protections for U.S. persons if the collection occurs outside U.S. borders.